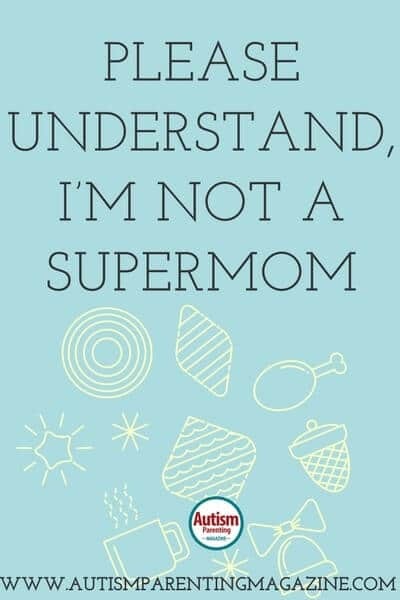 I’m not a supermom, but I get that a lot. Having a child with autism does not make me one. Please let me be weak and cry, let me make mistakes and let my guard down, and let me just be a mom, a wife, and a woman—not a “super” someone. The day my son Vedant was diagnosed with autism, life handed me a cape and said, “Now you fight and never stop doing so.” But there are days when I’m exhausted. I want to simply kneel down and wish that never again should a mom have to fight for what is rightly her child’s and hope that the world will be more sensitive to any child who has challenges. For once, I want to tell the bus driver who snatched my son’s straw away: “Please, be considerate. It’s my son’s sensory toy. It keeps him calm in a crowded bus full of noisy kids.” Some days I want to cry out loud and ask him to educate himself on autism. Instead of telling that teenager not to pity my son when I tell her he has autism, I wish the school and society taught her better so she would know autism has its strengths too. I am tired of explaining that autism is not the end of the world, it’s just a different world. No, I’m not a supermom. I feel rundown every now and then. Sometimes, all I hope is that the mom waiting in that lobby was more sensitive. My son simply wanted to be friendly with her little one, and that is why he came so close. He did not hurt her or scare her. Please don’t ask her if she is OK and implicitly teach her that my son’s attempt to be friendly could make her “not OK.” Let her learn to deal with a different kid. Let her learn to be accommodating. I don’t want to stand on a podium and explain to her the importance of inclusion. There are days when I don’t want to put up a fight every time someone shows me that society is still not ready to co-exist with a child with autism. Occasionally, when things get overwhelming, I feel like quitting and walking away. I don’t want to feel guilty about that thought. I need that weakness in me. I want those cracks so my pain can find a way out. There are days when sifting through all the treatments that have failed, I lose hope and I just want to suspend my optimism and cry. Just plain cry for fear of it never getting any better. Once in awhile, I want to stop trying, because it never seems to work no matter how much I do. Occasionally, I want to complain that it’s not fair—why me, why us, why him? In a weak moment, I wonder if not having a physical deformity works for or against my son. Some days, I feel jealous of moms who take their kids to soccer practice or a tuition class or swim lessons or a recital. Just for once, I too want to go to concerts, movies, and date nights. I want to attend parties, stay out late, and take a break from the hyper-vigilance that has taken over my life. For a change, I want someone to have my back when I’m exhausted of holding up my son’s. Sometimes, it’s that weakness that is so powerful. The burden of being a supermom is too heavy to carry. I wish it were a world where you were not forced to be a fighter, a supermom, and a constant advocate. If anyone is a warrior and has superpowers, it’s my son—not me. He is a superkid. I’m a single mother of a 3 1/2 year old Autistic boy. I completely get what you wrote. My family has been a major supporter through all of this and I honestly don’t know how my son and I could’ve come so far. They faithfully without complaint watch him while I’m at work. There is no way he could attend a “normal” daycare with his ASD. I wake up everyday and praise God for my son, and for the strength to get through this day, hour, or moment.